The amount of Vietnamese words I know I could count on two hands. I know that "bo" means beef and "ga" means chicken. "Chay" means vegetarian, "mi" means egg noodles and "cam on" means thank you. 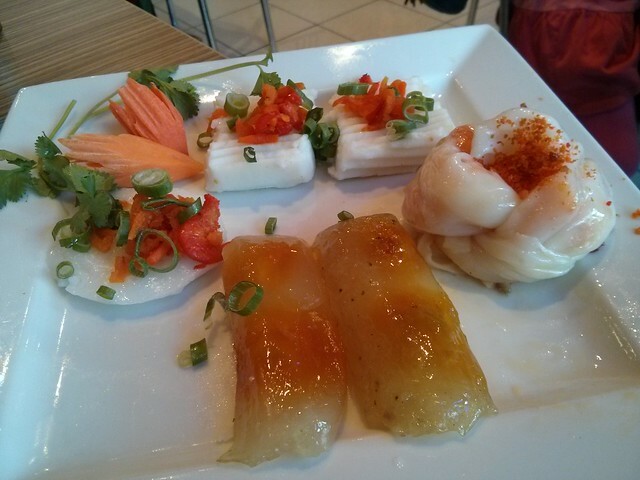 Here's an amazing banh platter from Thanh Ha 2 in Richmond, with banh cuon, banh duc, banh bot loc and banh beo! 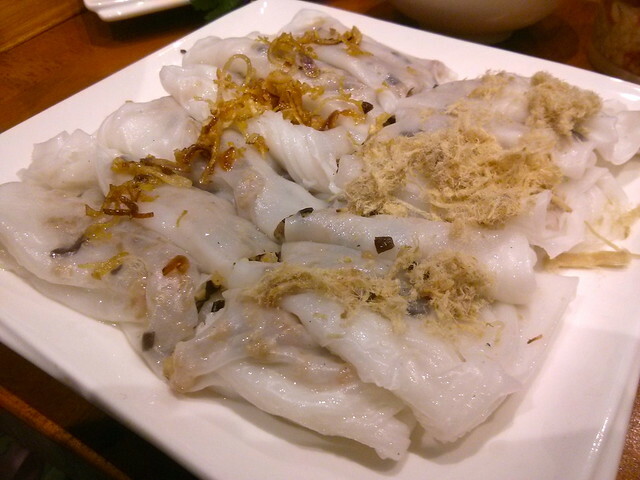 But my absolute favourite banh is - banh cuon. You might know these semi-opaque, gossamer-thin rice flour crepes from Xuan Banh Cuon in Sunshine. 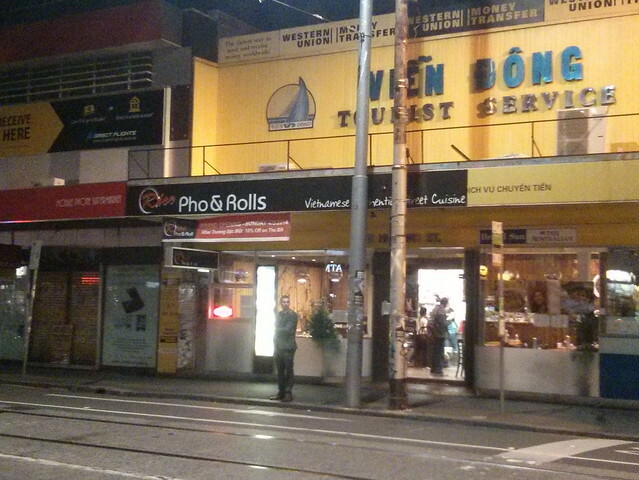 I am delighted to report that Footscray now has a first-rate banh cuon provider, too! Let's back up a little. 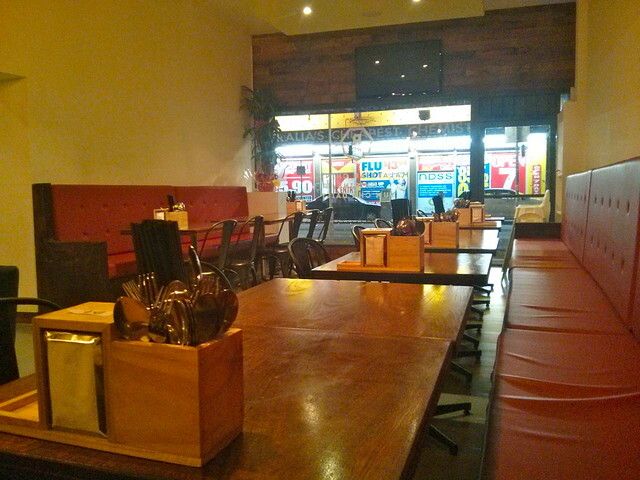 Rice Pho & Rolls has just opened right near the corner of Droop and Hopkins Streets, Footscray. While not as hip as Co Thu Quan or HM Quan, it certainly has a similar contemporary feel. I usually associate statements of "no MSG" with Anglified suburban Chinese restaurants, but Rice Pho & Rolls makes a similar claim that they use no MSG anywhere on the menu. So far, so good. The menu is small - just one page - and dominated by chicken, either in pho or as Hainan chicken. 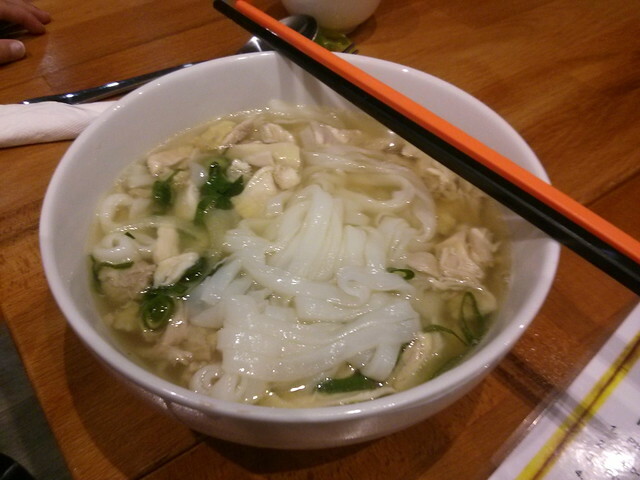 There's a kid-sized pho that is particularly excellent at $4. I know the pic doesn't look like much, but this is fantastic chicken soup. Bright, fresh and cleansing, and all the more amazing for no MSG. 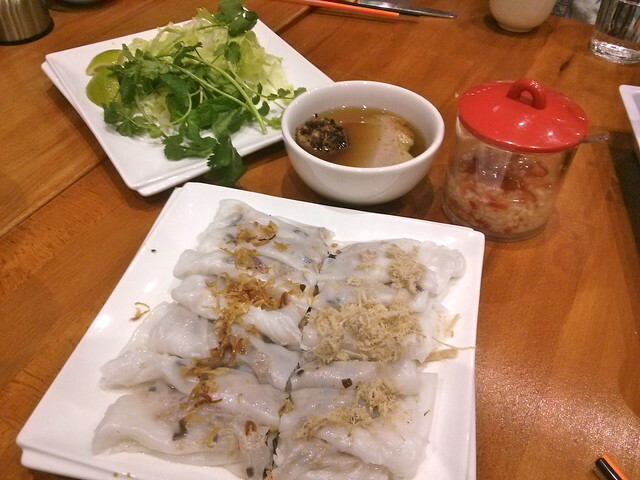 But of course, I only had eyes for one thing - the banh cuon ($10). They are made here (I checked) and they are FANTASTIC. They're rolled up with a little pork and prawn, and I think the filling has a more delicate flavour than XBC's, which occasionally can be a little strong on the pork. 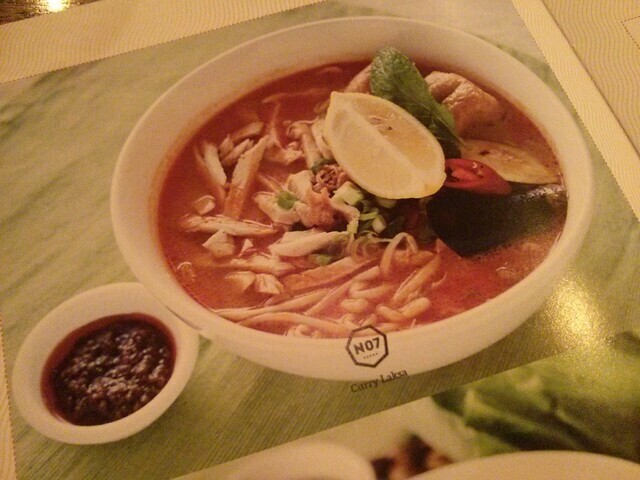 What I really loved, though, was the little bowl of hot soup alongside. This had a piece of springy Vietnamese sausage and a melt-in-the-mouth meatball with black fungus, but it was the broth that was the star. Squeeze in some lime, add a little garlic and chilli, and it's the most delicious, tangy, soothing thing to sup. 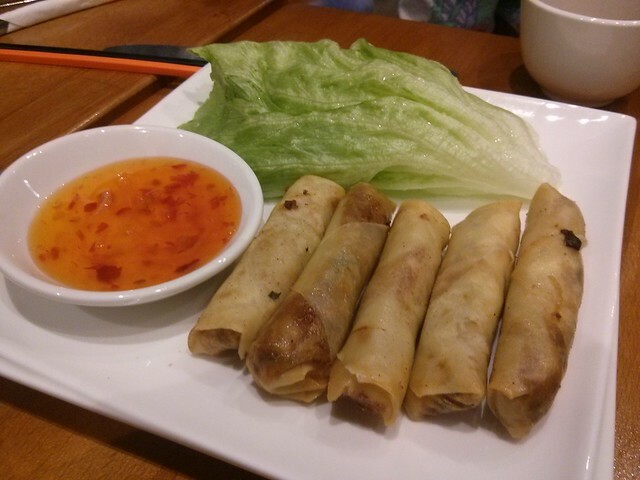 This is fantastic banh cuon and up there with XBC's offering. The only thing it falls down on is the accompanying salad - just chopped iceberg, mint and coriander. Some more variety would take it to the next level. But still - you HAVE to try this. 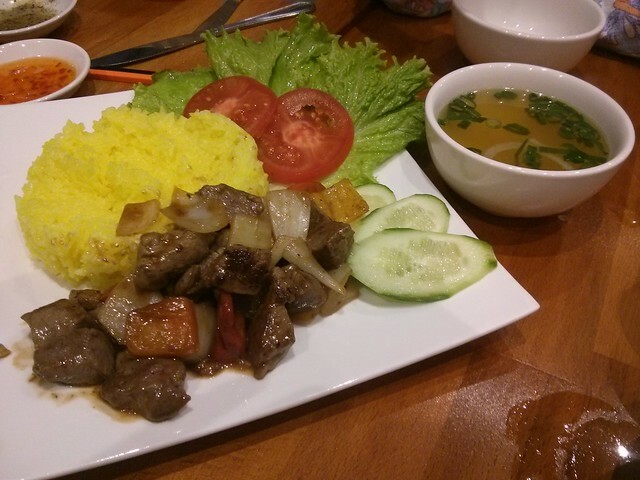 Bo luc lac - diced beef with capsicum, onion and "saffron rice" ($12) - was pretty good. 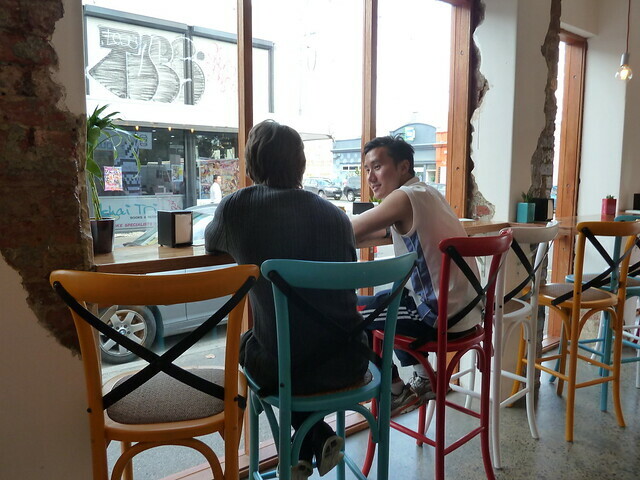 While I was there, I ran into Win from the Sunshine Business Association, who happens to be a friend of the owner. The no-MSG thing is fair dinkum, and Win reports his mate (the owner) is very into cooking really home-style food. I couldn't get this straight from the horse's mouth because the proprietor had left work early, as he and his partner had had a baby that day! 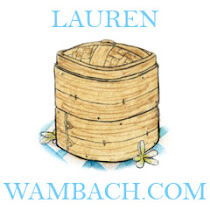 This is an exciting restaurant and one to watch. I look forward to exploring the menu a lot more. "Want some of my burger?" This conversation took place between my 4-year-old and I in downtown Droop St, just an hour or so ago. 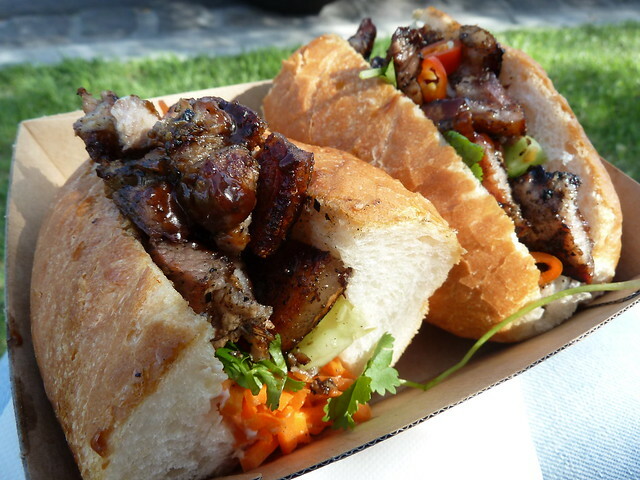 Yes - we were in the 'scray, talking about not banh mi, but burgers. 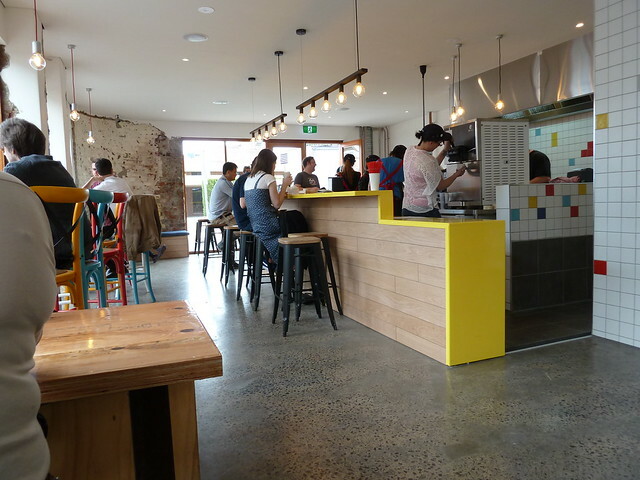 And we weren't shivering in the lee of a truck - we were in a real bricks n' mortar burger bar. 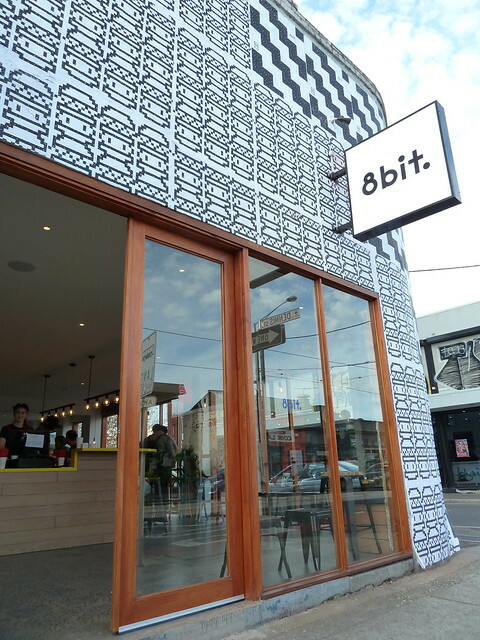 You should be, because 8 Bit has officially thrown its doors open today, and has brought a new style of dining to Footscray that I am very, very excited about. 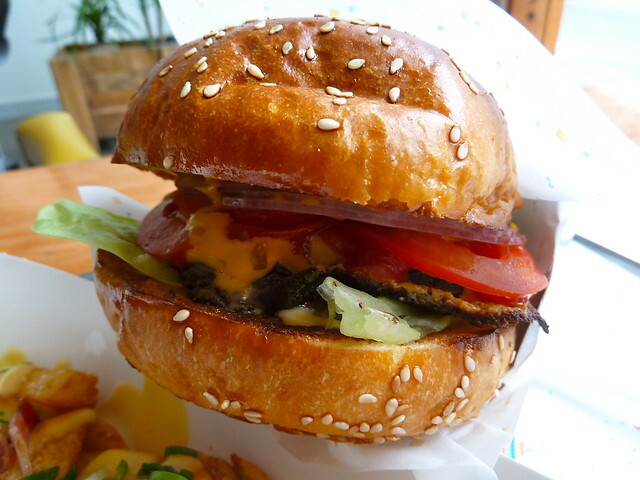 The theme is old video games, which is played out in some of the burger names ("1UP" mushroom burger, anyone?) 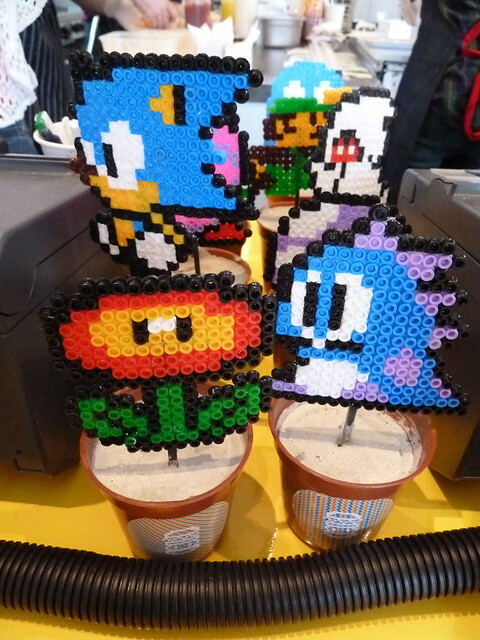 and in the awesome table number thingies. I could never play anything on Nintendo harder than Mario Bros - I just used to mash all the buttons with my fingers and occasionally my character would do something awesome. In the face of so much menu awesomeness (smoked frank with bacon, grilled onions and BBQ sauce, anyone? Crispy chicken burger with slaw and Sriracha??? 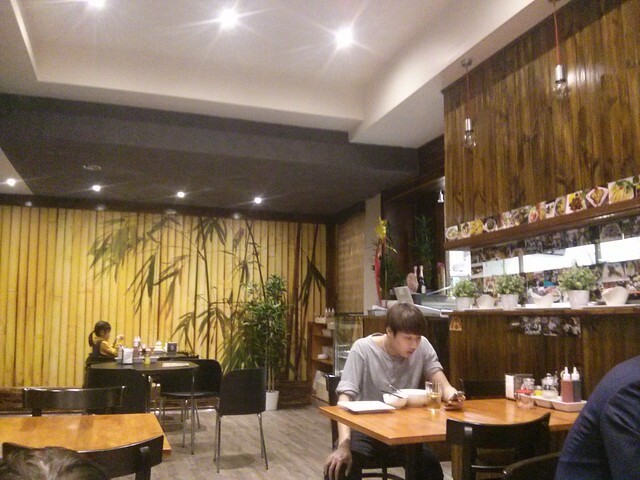 ), I kind of applied the same theory to choosing our meal. Oh em gee. So delicious. I went the classic 8Bit with Cheese, which was great. The burgers are cooked on a griddle and the patty had a great crust on the outside. Nice pickles and the now-classic brioche bun... Yum. But the fries! These were bury-your-face-in good. 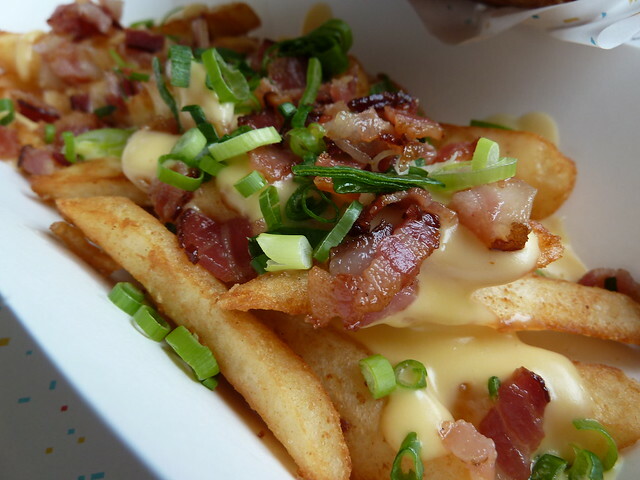 Covered in melted cheese sauce with quality chopped bacon - they were sensational. Can we reflect on the prices? I think they are crazy reasonable. 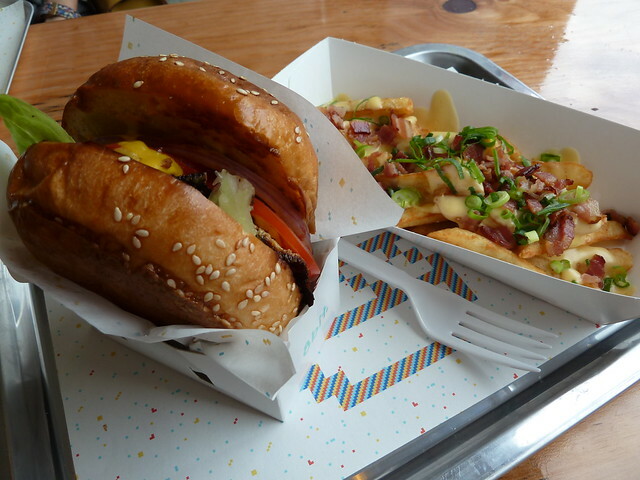 $8.50 for a burger, plus $3 for a side of beer-battered fries - that's way cheaper than Grill'd, and loads better. Lest you go howling about "hipsters" taking over the neighbourhood, you should know that two of the three partners behind this enterprise are Footscray boys, born and bred. The other is from Geelong, so he's got westie wings too. 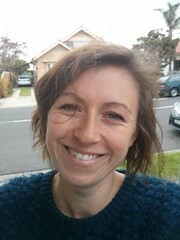 Anne, who had brought her lovely bub in pram in, was kind enough to let us share her table. The staff were super lovely and accommodating to the mum and little one, even bringing him a bickie when he got a bit over it all. 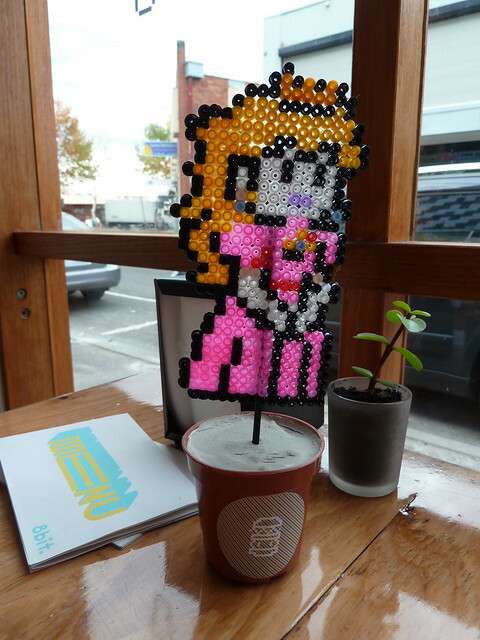 When this mama is similarly over it all, I intend to rely on 8 Bit just the same way - hopefully there will soon be some voddy to tip into those strawberry cheesecake shakes! "May the road rise up to meet you," goes the old Irish blessing to the weary traveller. The road I have in mind, though, isn't going to get a chance to "rise up" to meet anybody - it's about to get hit with a stampede. 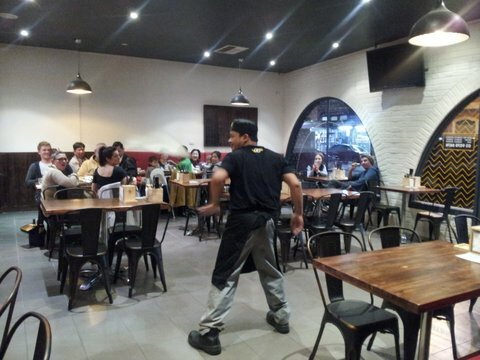 Roti Road is a brand-new Malaysian-Chinese restaurant that has just opened in Footscray on the site of the old Yummie. It's had an epic makeover, complete with glossy wood, red banquettes and green-leaved potted plants dotted throughout. We were wandering by, perfectly content with our dinner plans at an old favourite, when we saw that it was open for business. Wild horses etc etc. Thus you'll have to forgive the quality of the camera phone photos on this instance - I was a bit underprepared! House-made roti with three dipping sauces of sorts (sweet and almost smoky chicken curry sauce, a lovely dal, and jammy sambal). This roti is unreal. The whole plate is $5.90 (YES) and you can add a very excellent chunky lamb (or beef, or chicken) curry for an extra $4. 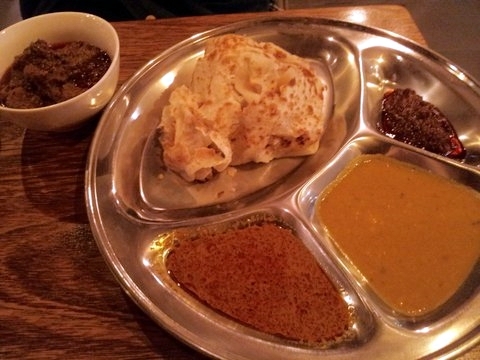 This roti rivals Mamak - seriously, you have to try it. 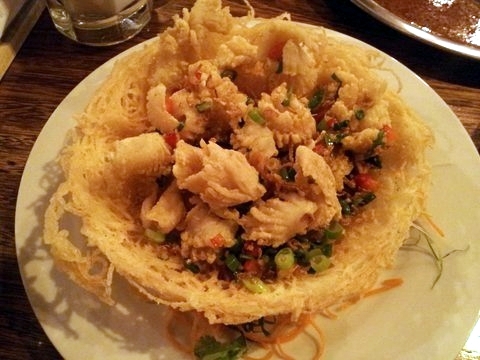 Just some good old salt-and-pepper squid in a noodle basket. This was done well. These chicken dumplings looked gorgeous on the menu (indeed, most things do - they're beautifully photographed) but I found them a bit lacking in flavour and juice. A bit of soy and vinegar, though, and Bob's your uncle. The little "webs" aren't attached to the bases but are separate, which is unusual. We were busy gorging ourselves when suddenly, an upbeat dance track came on and the stereo got turned up. 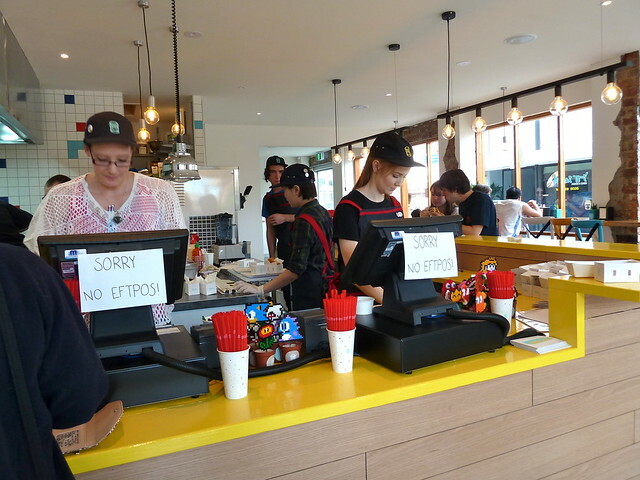 We peered about, wondering what was going on, but the staff were all looking at the floor with knowing smiles. Suddenly, out of the kitchen bounded a chef, twirling and flipping a tissue-thin sheet of roti pastry like pizza! 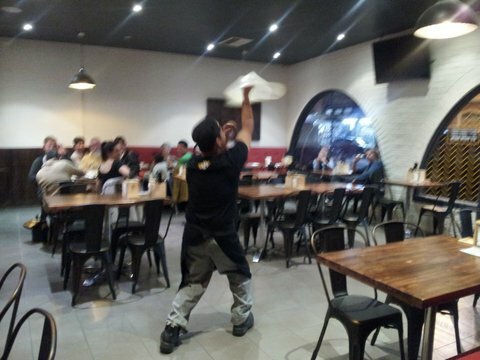 He popped and locked his way through the whole track, all the while spinning his roti in the air, while the patrons whooped and cheered. It was so unexpected and so joyful. Apparently this happens every evening! Can you find the roti? 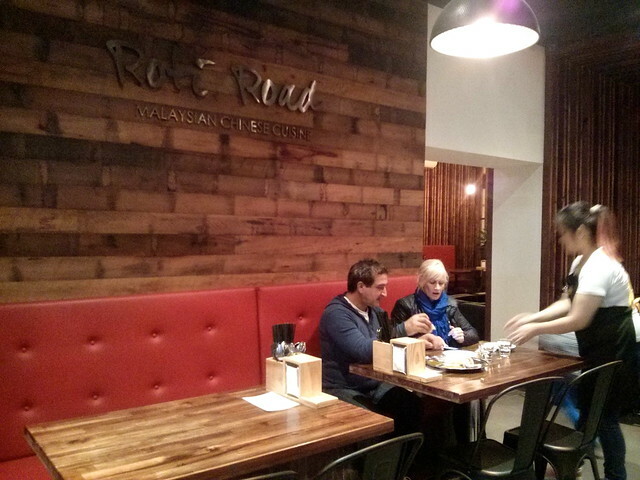 One half of Roti Road is David Tran, who is the son of Yummie head honchos John and Annie Tran. 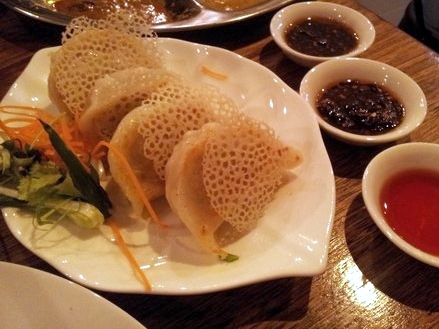 Devotees of their dumplings can rest easy that yum cha is still on offer daily until 3pm. I had a quick chat to David after our meal and he confirmed that their head chef is Malaysian, and everything is made here from scratch, from the roti to the laksa paste. Speaking of which, here's what you have to look forward to! 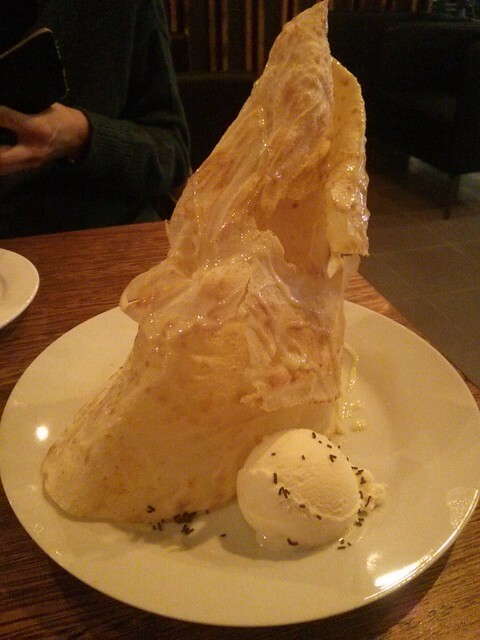 David shouted us this Matterhorn of a dessert - roti with condensed milk and icecream. Completely OTT fun. 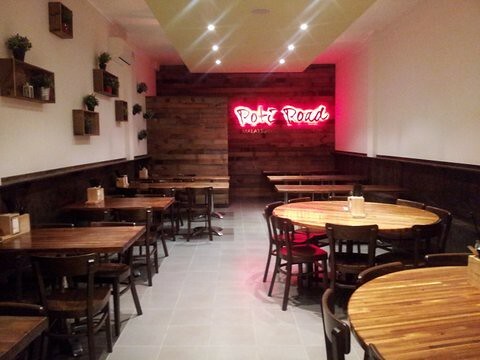 Roti Road is officially opening today, Friday 2 May. I love the decor, which feels smart but not slick. The food is really good and I can't wait to try more. The toilets need some TLC but I believe that was meant to be happening over the last few days, plus some more artwork going on the walls. Oh, and it's BYO for now but a licence is in the works. 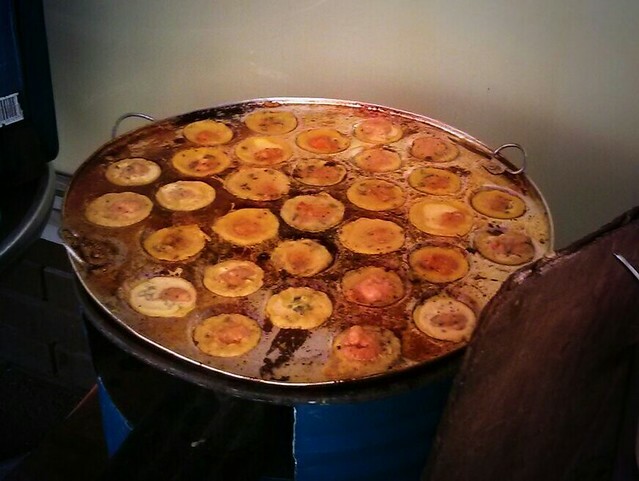 No need to divert to Flemington, Footscrazies - when it comes to Malaysian food, we can go our own way now!